Effective post orders provide the backbone for a successful security program. Without them, security officers are placed in a position of uncertainty and may act inefficiently and beyond the scope of their authority. Post orders, a component of standard security practice, are the written guidelines that cover the security operations at a facility. They not only direct officers on how to patrol a site, they also provide instructions on how to handle specific situations. Clearly defined post orders outline expectations and requirements, which as a result, protect both the client and the security company from potential liability risks. Effective post orders allow for consistency in patrol and reporting by acting as a checklist. In addition to emphasizing the purpose of the security program, such as access control, routine patrol, surveillance, or all three, post orders also provide security officers a schedule for security tasks as well as document the scope of their responsibilities limiting the opportunity for litigation claims. Without post orders, officers cannot be expected to operate efficiently. Post orders are not to be confused with generic security procedures. 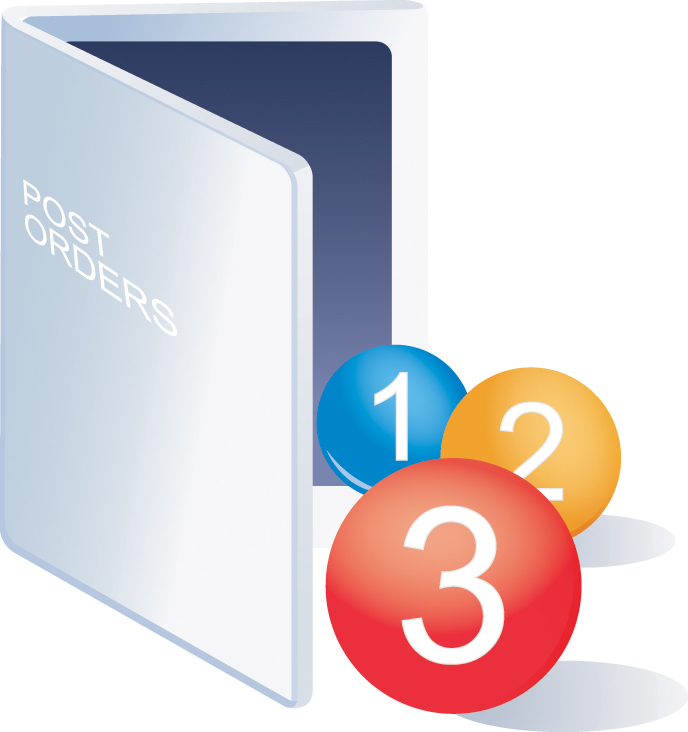 Post orders are comprehensive and facility specific. The clients, security company and officers should all be involved in the creation and review process. Once the post orders have been finalized, a copy of the guidelines should be placed on the post with the client retaining a copy. In order to maintain their relevancy and effectiveness, post orders must be communicated to all of those involved initially and periodically with every change in procedure. Testing, monitoring, or any other forms of supervision must be established to ensure that officers are not only aware of these changes, but are also following them in a disciplined manner. Daily activity reports and incident reports are both effective forms of supervision. In addition, incorporating patrol supervisors and electronic check-in devices can ensure their accuracy, and the overall adherence to post orders. Effective post orders provide the backbone for a successful security program. Without them, security officers are placed in a position of uncertainty and may act inefficiently and beyond the scope of their authority. To guarantee a high quality security program that protects facilities from both physical and financial harm, businesses must create and implement up to date post orders. Last, the use of post orders applies, in one form or another, to the protection of high net worth individuals and families while at their home or office. The World Protection Group, Inc. (WPG) is a Los Angeles-based global provider of executive protection, threat management, uniformed protective services, security consulting, and asset protection. To learn more about WPG, please contact Kent Moyer, President, at +1-310-390-6646 or by email at kmoyer@theworldprotectiongroup.com.